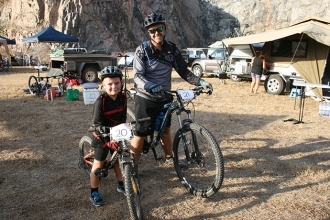 Thanks to Graham Crawford of Free Radicals Triathlon Club for providing this first-hand account of the Julia Creek Dirt n Dust Festival Triathlon on the weekend of April 17-19. A great insight for those thinking about doing it next year! It’s now the third year in a row that I find myself on the banks of Eastern Creek: A little scary considering that, after each one, I’ve always said “never again”. At any other time of year this is just a cattle creek, pretty much in the middle of nowhere. There’s a bridge over the creek – in one direction is Cloncurry, the other direction is Julia Creek – this is the direction that matters. It’s 25km of country road to Julia Creek with nothing but big sky and cattle country all around. And at any other time of the year you’d cross over this creek at 110km/h, perhaps barely noticing it. But now, this morning, it’s the spiritual home of Dirt n Dust and I’m surrounded by 250 other athletes, a bus load of spectators and two chooks. 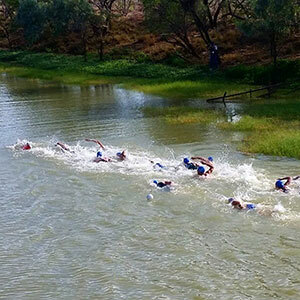 All who have made the pilgrimage to Julia Creek to compete in this iconic annual triathlon (except perhaps the chooks). 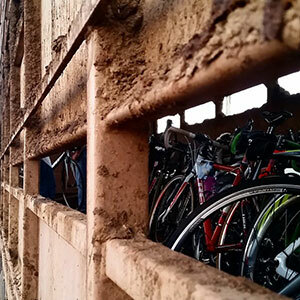 Bikes in the cattle truck. We’ve been ferried from the event headquarters in buses after loading our bikes onto a road train that the buses followed. How many and how much the cargo is worth is pure speculation, but something not lost on the crew that diligently load and unload them. The buses are air-conditioned, the creek bank is not, and now the heat is building. There’s a jet ski in the water and it’s surrounded by the familiar red and yellow uniforms of lifesavers. They launch their surf skis into the creek and start to paddle: It’s a sign things are about to happen. The competitors have now racked their bikes and crossed over to the starting side. The crew starts marshalling everyone into waves. There’s going to be 11, roughly 20 athletes a wave, which makes for a crowded start. Before I know it, the first wave is in the water and lining up, the starter counts down, and – along with him – all 300 competitors join in. Five, four, three, two, one. The crack of the starting pistol is quickly drowned out by the washing machine sounds of 20 athletes, which in turn is drowned out by the cheer of the competitors, and again washed away by the next wave hitting the water. The water is refreshing and a welcome relief to the heat: It’s easy to lose yourself in the cool and forget what’s about to happen. Crack, 19 people surrounding me start off and I get swamped in the wave. I launch myself into the middle of them and it’s on. There’s a few touches – hands, arms, feet – but it’s all good and things start to move. The swim in Eastern Creek. Unfortunately for me it’s my heart rate monitor that’s moving the most: Within 50m it has slipped down my chest to my waist. I like to think it was the speed I was swimming, but in truth it was probably the elastic. 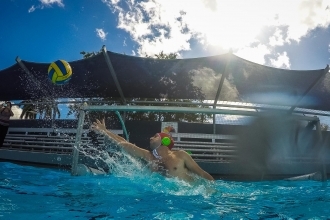 I manage to tuck it into my pants to stop it wrapping around my feet in a manoeuvre that my swim coach would be proud of; grace under pressure… well maybe. And then comes the next round of obstacles: swimmers in the wrong lane! Although I’m swimming close to the centre there’s definitely a lane rope between us and I know I hadn’t crossed it! Then there were the breaststrokers, the backstrokers and the ever-present weed, which is always a surprise if you’re not used to it. There was a clump towards the exit and this proved handy to get some extra traction on the way out. The green matting makes for a speedy creek exit into the transition area where the bikes await. 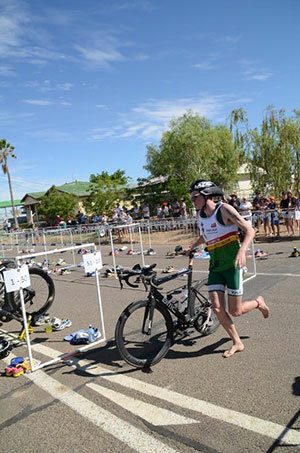 Transitioning onto the bike is easy; navigating the mud that had formed from the countless wet swimmers is hard. There’s something to be said for starting in an early wave. 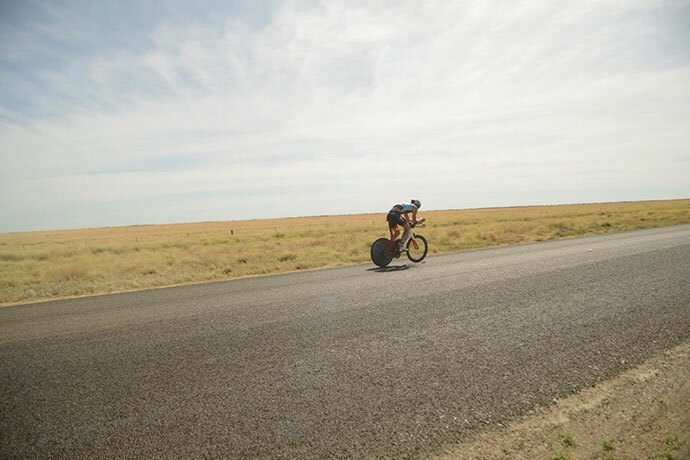 I wheel my bike over the mount line and in an awkward hop, skip and wobble I make a flying start – I’m all over the road, embarrassingly so, but I’m moving and I’m moving forward. I slip my feet into the shoes already on the pedals and start turning. Ahead there’s a line of cyclists, but the ground is littered with sporadic objects that have fallen from those bikes. The first is a pair of sunglasses, my front wheel jerks left and right around them while my back wheel narrowly misses: I swerve wildly across the road, recover and breathe a sigh of relief. As I pull away I hear a crunch behind me. The sunglasses are DNF. The other objects ahead are gels, full and empty, bottles and anything else that wasn’t secured well enough for this country highway: a rookie error. The Free Radicals Triathlon Club contingent. I continue on; the heat is being offset by the headwind. At its most fierce, it will beat you into submission and bring you to a crawl – you can only fight it for so long. But not today. It comes and goes: it’s not strong nor constant. I continue to pass competitors – a lone competitor passes me, which is perhaps the only plus of starting at the rear. Meanwhile the odd road train slowly passes in the other direction respectfully. The water tower comes into view on the skyline. It shifts from left to right and back again as the road curves into town, growing like a mushroom. The road narrows, I take the left fork and suddenly the solitude of the open road turns into the centre of town. The front-runners are already on the run course, spectators line the pavement and there’s even a band playing. I loop the town and rack my bike. 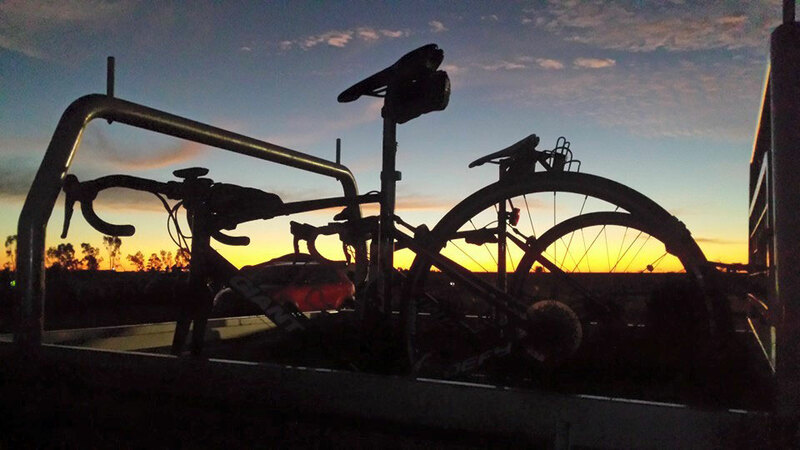 The transition isn’t as smooth as expected – there’s not much room, the bike doesn’t go on the rack on the first attempt, and while I’m exchanging my cycling shoes for runners the helmet topples off the bike and I take one to the head – what are the chances? Heading out on the run course the first thing you feel is the heat: It’s dry and starts sucking the moisture out of you with every breath. But, thankfully, there are many water stations along the route with volunteers handing out ice-cold water and cloths, and a clever runner knows how to combat the heat with them. The course is three loops around the town, bringing everyone together in close proximity. The white and green of the Dirt n Dust shirt is everywhere but underneath you can see the trisuit colours of the different clubs that are represented. 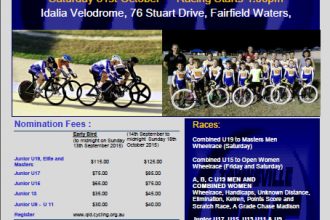 There’s the newly-formed Julia Creek Scorchers and the Cloncurry Cats, the Mount Isa Rats, Townsville Tri Club, Free Radicals Tri Club, Longreach Tri Club… the list goes on. What representation! How far did we all have to travel for this? As I weave my way over to the refreshment tent, there’s just two questions burning away unanswered: How did I do? How did I do compared to last year? I fumble with my watch until it spits out the details – 1:23:05 – that’s great. It brings a tear to my eye as it’s five minutes faster than last year (one minute faster on the swim, one minute faster on the run and three minutes faster on the bike). 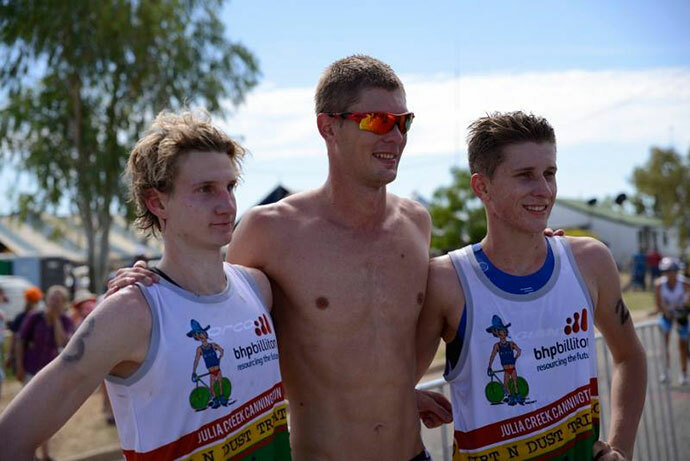 Winner Sam Betten (middle) from Brisbane with Townsville’s Edward Dawson (left) and Connor McKay (right) who came second and third respectively. The refreshments consist of fresh fruit, cold water and rehydration fluids all served by volunteers under the shade. More-and-more people gather, cheering the competitors in one-by-one. There’s a medical tent for the unsteady with volunteers helping. The noise builds and the satisfaction of completing the course with a great time is overwhelming. It peaks and slowly dies away as the last competitor is cheered over the line. At this point the race is finished leaving just the celebration photos to be taken. The gear is brought back from the first transition, reunited with its owners. The announcer closes the event, the results will be posted at the event headquarters in a couple of hours and it’s all over for another year. Now the real celebrations begin. 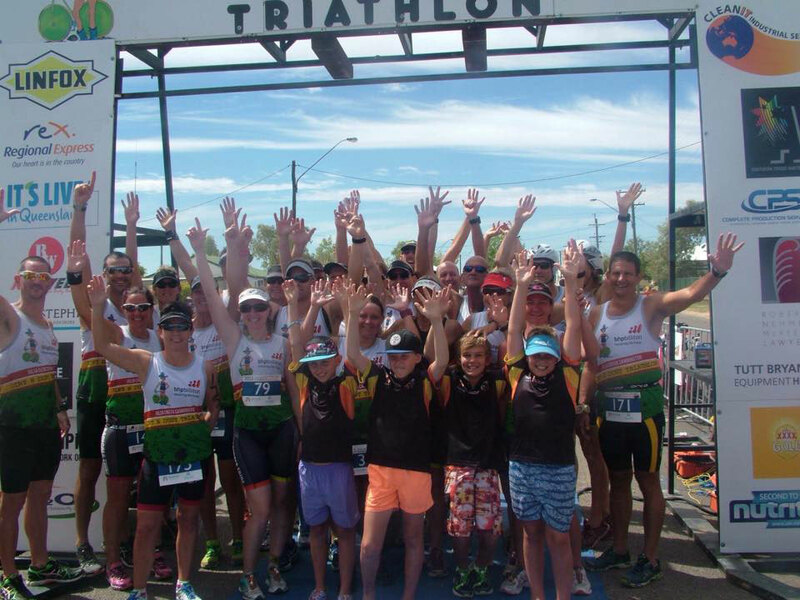 For the results from the 2015 Julia Creek Dirt n Dust Triathlon see here. A Graham Crawford photo bomb. The sun sets on an awesome day in the bush. 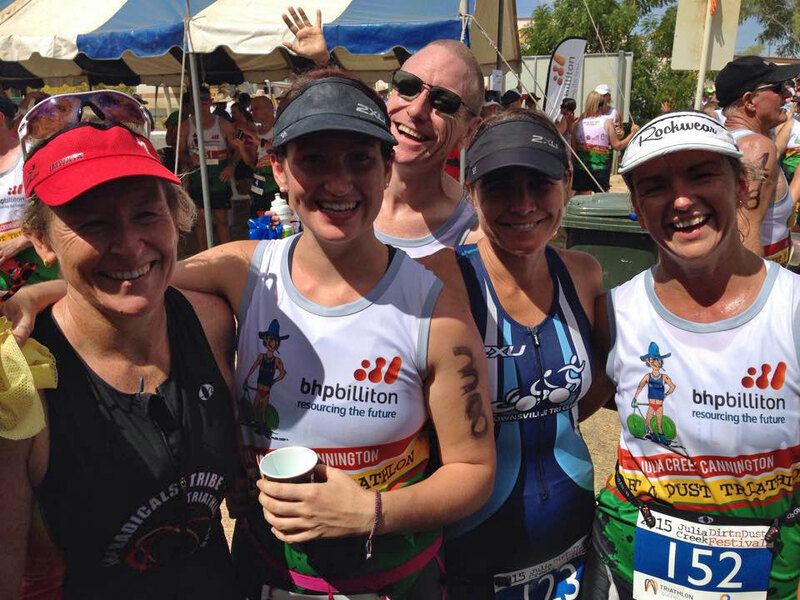 Free Radicals is a family-friendly and all-ability triathlon and multi-sport group for the Townsville region. We aim to help all individuals maintain fitness for life, not just for a race. A holistic approach to fitness and wellbeing is where we are aiming; bringing into play experts and experienced athletes to help you and us achieve our goals.